As I have written here before, I absolutely love the Bay Bridge in San Francisco, CA. It's a marvelous, imposing and beautiful structure. If you happen to follow me on Google+ then you may have seen a couple of iPhone shots I posted from San Fran while I was out there last week. I was very busy at work, but did find some time to get out with the D700 and fire off lots of brackets. The Bay Bridge was an obvious target, and my hotel is pretty close so that makes it easier. Despite several visits here over the last year or so, I had never had the chance to get up and shoot it at sunrise. So, that was a definite goal of mine for last week. And, well...here it is. 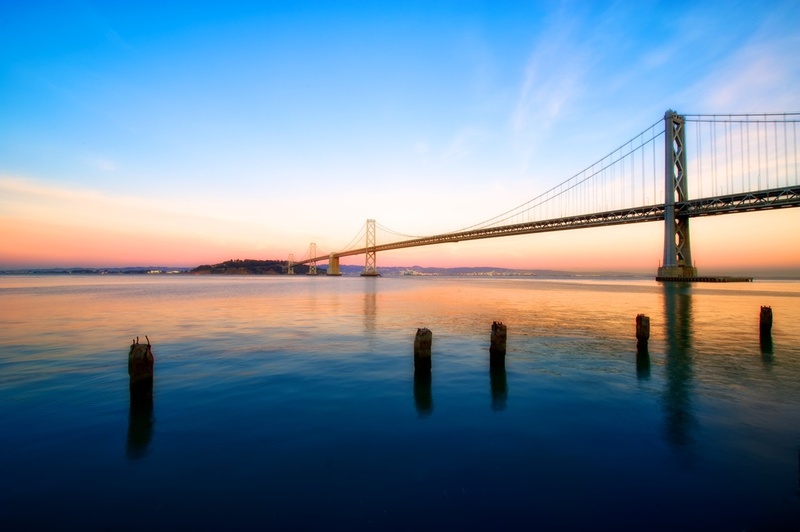 Sunrise is a beautiful time to shoot, and doubly so when you can share it with the Bay Bridge. In case you missed it, take a look at my previous post - I am giving away 2 free copies of Topaz Adjust v5!! Topaz Adjust v5 free giveaway! !